The SUNY Upstate Medical University is in the city of Syracuse, in central New York State. 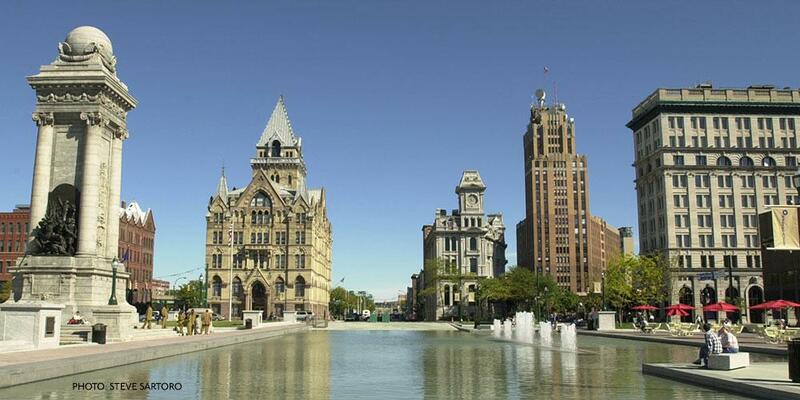 Syracuse has a metropolitan area population of approximately 750,000. Central New York is a beautiful, friendly and very affordable place to live. Summer and winter, there are ample outdoor recreational options at our numerous nearby county and state parks. Downhill and cross-country skiing, ice skating, swimming, boating and hiking opportunities are all within a 30 minute drive of the medical center. The small but trendy downtown Armory Square district offers shops, restaurants, and upscale housing. A Creek Walk connects Armory Square to the Inner Harbor recreational area of Onondaga Lake. Syracuse University offers many cultural opportunities and our professional theatre, Syracuse Stage, offers very high quality productions. Housing is affordable. Access to and from the medical center is easy and very good school systems are available with easy commuting distance to downtown. Things to see and do on campus and beyond. Download this Visitor's Guide. Many restaurants, nightclubs and shops are within walking distance of campus on "the hill" near Marshall Street, and downtown in and around Armory Square . The city's New York State Fairgrounds, site of the annual New York State Fair, also has a year-round schedule of ice shows, hobby shows and similar activities. Public transportation is available to shopping areas, theaters, restaurants and recreational areas. Numerous golf courses, both public and private, are located in the city and surrounding towns. Central New York is a haven for enthusiasts of winter as well as summer sports. Downhill and cross-country ski areas are within easy driving distance. Skating, tobogganing, dogsledding, snowmobiling, ice fishing, ice boating and other cold weather activities are also popular. New York City, Niagara Falls, Boston and Atlantic Ocean resorts are only hours away. Last Modified: November 08, 2018. Contact Kay Magnarelli with questions about the content of this page.